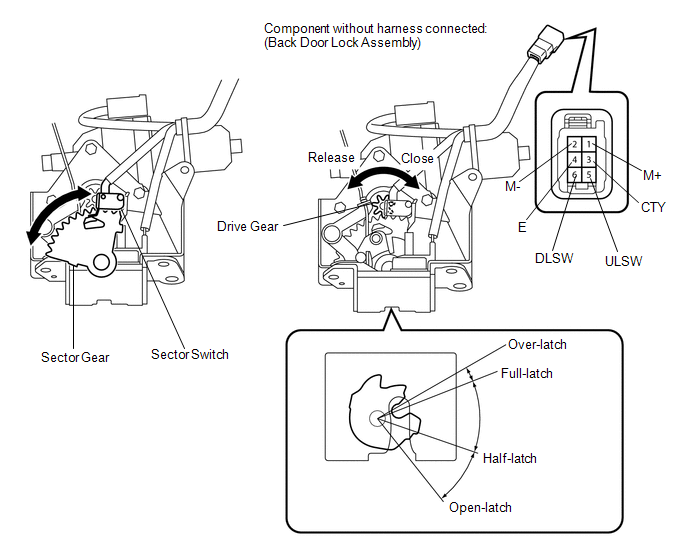 When the back door cannot be opened, one of the following may be malfunctioning: 1) power back door ECU (power back door motor unit)*1 or back door closer ECU (multiplex network door ECU)*2, 2) back door lock assembly, 3) back door opener switch assembly, or 4) main body ECU (driver side junction block assembly). 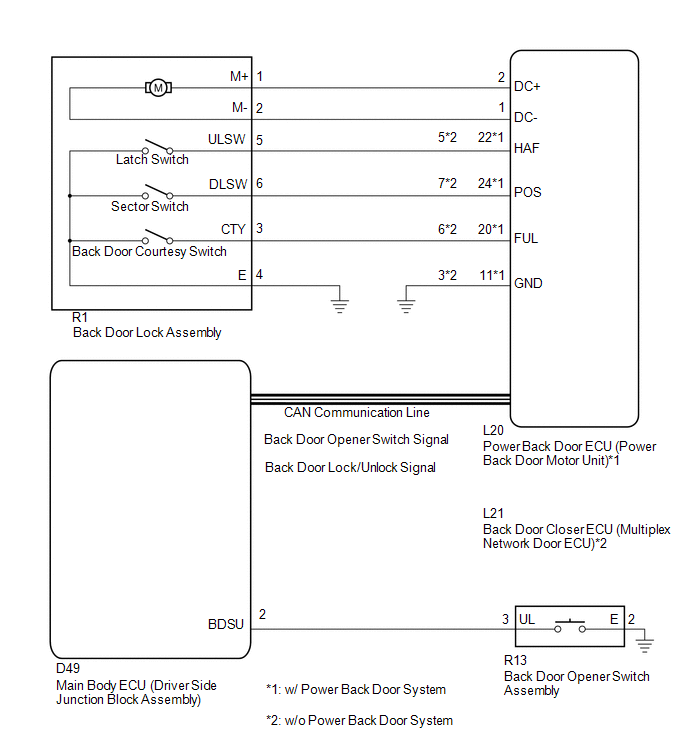 The back door closer system uses CAN communication. First, follow "How to Proceed with Troubleshooting" and at step "Check Communication Function of CAN Communication System", confirm that there is no malfunction in the CAN communication system. After confirming that B2250 or B2251 is not output, proceed with troubleshooting. (a) Connect the Techstream to the DLC3. (b) Turn the ignition switch to ON. (c) Turn the Techstream on. (d) Enter the following menus: Body Electrical / Main Body / Data List. (e) Check if the back door lock functions properly. The back door functions as specified in the normal condition column. (d) Enter the following menus: Body Electrical / Back Door / Data List. (e) Check if the switch functions properly. The back door opener switch functions as specified in the normal condition column. (a) Remove the back door lock assembly (See page ). 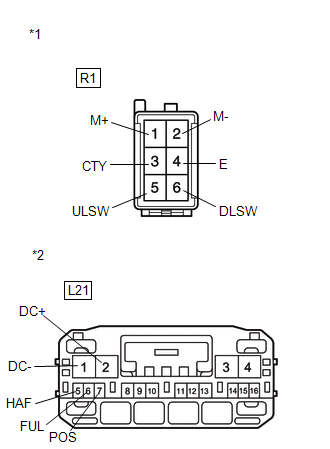 (b) Apply battery voltage and check the operation of the door lock motor. (c) Measure the resistance according to the value(s) in the table below. (1) Disconnect the R1 back door lock assembly connector and L20 power back door ECU connector. (2) Measure the resistance according to the value(s) in the table below. (1) Disconnect the R1 back door lock assembly connector and L21 back door closer ECU connector. (a) Remove the back door opener switch assembly (See page ). 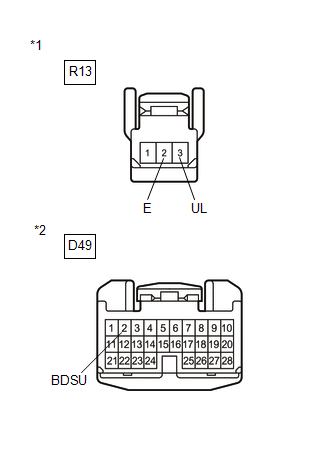 (a) Disconnect the R13 back door opener switch assembly connector and D49 main body ECU connector.